Falvey Memorial Library :: FindingAugustine.org featured: "Window Shopping"
“FindingAugustine.org: A rich & readily accessible bibliographical collection concerning Augustine of Hippo and his legacy” is the latest cultural window exhibit in Falvey Memorial Library. FindingAugustine.org is an international collaboration between the Katholieke Universiteit Leuven in Leuven, Belgium, and Villanova University. This window, which provides information about FindingAugustine.org, is timely since November is Augustinian Heritage Month. posters advertising the Confessions Alive! event. This last item refers to the marathon reading of the Saint Augustine’s Confessions, which took place in Falvey on Nov. 3. Dark red draperies and bamboo panels with collages featuring images of Saint Augustine of Hippo flank the exhibit, focusing our attention on it. Unlike the images of most saints, no standard image of Saint Augustine exists. The two panels illustrate the range of images Joanne discovered. 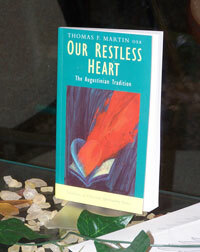 Father Martin (1945-2009), served as founding director of the Augustinian Institute at the University and is the author of Our restless heart : the Augustinian tradition . Two posters with photographs present information, provided by the Augustinian Institute at Villanova, about Father Martin. This display was created at the direction of Darren Poley, Outreach librarian, who notes that the window has three purposes: to honor Father Tom and the Augustinian Institute, to draw attention to FindingAugustine.org, and to commemorate Augustinian Heritage Month. Falvey Memorial Library has worked with the Augustinian Institute to make an extensive bibliography available to scholars worldwide. The exhibit will remain up until December 1. Gerald Dierkes, Laura Hutelmyer and Judy Olsen contributed to this article.